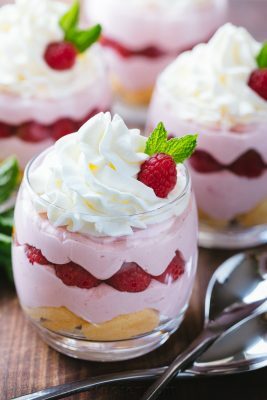 The sweet/tart mousse is bursting with fresh raspberry flavor (there are NO artificial colors or flavors). It is an easy and impressive dessert. In a medium sauce pan, combine 10 oz frozen raspberries and 1/2 cup sugar. Cook stirring occasionally until jam consistency. Remove from heat and strain through sieve, pushing on the back with a spatula to get all of the juice possible. Off the heat, stir in 2 Tbsp lemon juice and 1 Tbsp gelatin. Pour back into saucepan and place over medium heat, whisk until gelatin dissolved and mixture is hot (not boiling). Remove from heat and cool to room temp (transfer to a different bowl to cool faster) and don't let it sit too long once it's at room temp or it will thicken and become difficult to blend. Cut lady fingers into 3 pieces. Make syrup and dip each lady finger piece in syrup 2 seconds then layer 2 full lady fingers in the bottom of each cup (6 pieces total). Once raspberry syrup is at room temp, beat 3 cups heavy cream with 6 Tbsp powderd sugar on high speed 2 minutes or until whipped and fluffy (do not overbeat or it will turn buttery). Reserve 1 1/2 cups of whipped cream and transfer it to a pastry bag fitted with a large star attachement. Refrigerate until ready to use. Into the remaining big batch of whipped cream, Gently fold in the room temp syrup 1/4 at a time, folding to incorporate between each addition. Transfer to piping bag fitted with round 3/8" tip and pipe over lady fingers to a 1/2" thickness. Repeat with all 6 cups. Set aside 6 of your prettiest raspberries for the topping. Place remaining raspberries over your mousse, arranging them in a circle around the edges and then placing a few in the center. Pipe another half inch of mousse over the raspberries. Finally, pipe reserved whipped cream and garnish with raspberry and mint if desired. Refrigerate at least 1 hour or until set. Enjoy!